Former NFL players Mike Golic and Darren Woodson talk about their experience with getting paid for hard hits. Having a bounty system that financially rewards players for taking out the opposition is less offensive than the arrogance Loomis and Payton showed in not putting an end to it after the league first investigated the Saints in early 2010. They weren’t scared or swayed by the thought of being exposed doing something that violated NFL rules. They let the pay-for-big-plays system remain. By doing nothing, Payton and Loomis rubber-stamped the program and said it was OK to go out there and try to take out someone, be it Brett Favre or Kurt Warner or whomever, with a vicious, even late, hit. If the NFL’s report is true, Loomis defied a direct order from his owner. That is grounds for dismissal. And Payton was no better. 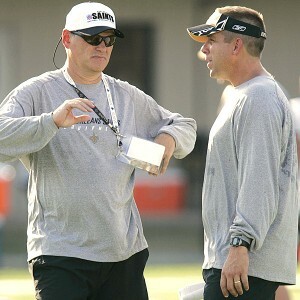 Saints coach Sean Payton and GM Mickey Loomis didn’t participate in the bounty program, but didn’t prevent it, either. Payton knew, and did nothing. Loomis knew, and did nothing. Reason would have it if they disapproved of a bounty system, they would have stopped it. By not stopping it, they encouraged it.And that was stupid. NFL commissioner Roger Goodell has made player safety one of his top priorities, and for good reason. Research continues to show more and more players are suffering brain damage as a result of sustaining concussions while playing football. The lawsuits against the NFL, like the wrongful death suit recently brought by the family of Dave Duerson, the former Chicago Bear who took his life last year, will only continue to mount, particularly if Duerson’s family wins. Goodell has gone overboard to legislate against big hits and dirty play by spending the past few seasons levying significant fines on players. You can’t hit a defenseless receiver. You can’t lead with your head. Ask any defensive player. They will tell you Goodell is trying to change football, and not necessarily for the better. And, most of them will tell you, Goodell’s fines have worked. It is inconceivable, given how big the player-safety issue has been, for Payton and Loomis to not recognize the environment change that has occurred in the NFL. Defensive players complain about the fines every week. They appeal. Their appeals usually are denied. And they gripe and complain and voice their displeasure. So to allegedly institute a bounty system in this era is just lunacy. This isn’t the 1980s or 1990s. This is Goodell’s era, in which protecting the shield matters. We know about CTE and we know Duerson shot himself specifically in the chest, apparently so doctors could dissect his brain and further the conversation about the dangers of the sport. To condone a system in which a player is paid $1,500 for a “knockout” shot and $1,000 for a hit that results in a player being carted off the field is the height of arrogance. The bounty system is bad, but this is football. It is an ugly game. Bad things happen under the piles. Eyes get poked. Body parts get pulled. If you don’t want to know, don’t look too closely. This game is violent and nasty, and those players who succeed do so through intimidation and fear. But thinking that the rules don’t apply to you, that somehow you are better than the other 31 teams, coaches and front offices, that to me is worse. That has become a hallmark of the Saints under Payton and Loomis. They’ve earned the reputation for doing what they want to do. On the Tuesday before their Super Bowl victory, the Saints purposely arrived at media day an hour late. It had never been done. The NFL has an annual day-after Super Bowl news conference with the winning coach and MVP, and Payton had to be strong-armed into going. Rules are rules, but the Saints too often act as if the rules don’t apply to them. Goodell will bring down the hammer soon enough, and the prevailing feeling is that his punishment will be harsher than the one levied on New England for Spygate in 2007. Then, Goodell fined the Patriots $250,000 and Bill Belichick $500,000 and docked the team a first-round draft pick. This could include multiple picks and possible suspensions because the Saints were told to stop and didn’t.